It is only the latest bad news about the dramatic decline of insect populations.Another insect in serious trouble is the wild bee, which has thousands of species. Nicotine-based pesticides called neonicotinoids are implicated in their decline, but even if they were no longer used, experts say, bees, monarchs and many other species of insect would still be in serious trouble. The loss of bugs is no small matter. Insects help stitch together the web of life with essential services, breaking plants down into organic matter, for example, and dispersing seeds. They are a prime source of food for birds. Critically, some 80 percent of our food crops are pollinated by insects, primarily the 4,000 or so species of the flying dust mops called bees. “All of them are in trouble,” said Marla Spivak, a professor of apiculture at the University of Minnesota. Farm fields are not the only problem. Around the world people have replaced diverse natural habitat with the biological deserts that are roads, parking lots and bluegrass lawns. Meanwhile, the plants people choose for their yards are appealing for showy colors or shapes, not for their ecological role. Studies show that native oak trees in the mid-Atlantic states host as many as 537 species of caterpillars, which are important food for birds and other insects. Willows come in second with 456 species. Ginkgo, on the other hand, which is not native, supports three species, and zelkova, an exotic plant used to replace elm trees that died from disease, supports none. So the shelves are nearly bare for bugs and birds. Native trees are not only grocery stores, but insect pharmacies as well. Trees and other plants have beneficial chemicals essential to the health of bugs. Some monarchs, when afflicted with parasites, seek out more toxic types of milkweed because they kill the parasites. Bees use medicinal resins from aspen and willow trees that are antifungal, antimicrobial and antiviral, to line their nests and to fight infection and diseases. “Bees scrape off the resins from the leaves, which is kind of awesome, stick them on their back legs and take them home,” said Dr. Spivak. Besides pesticides and lack of habitat, the other big problem bees face is disease. But these problems are not separate. “Say you have a bee with viruses,” and they are run-down, Dr. Spivak said. “And they are in a food desert and have to fly a long distance, and when you find food it has complicated neurotoxins and the immune system just goes ‘uh-uh.’ Or they become disoriented and can’t find their way home. 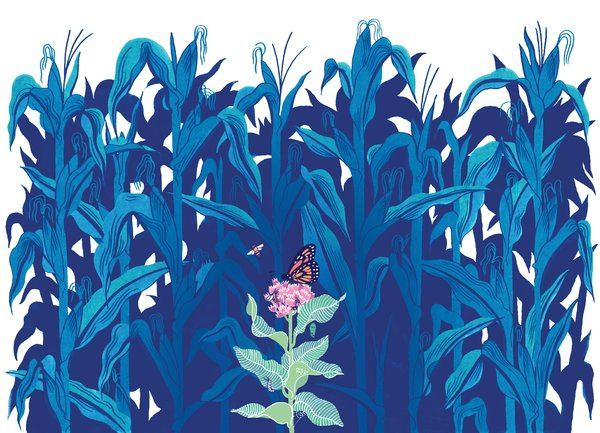 It’s too many stressors all at once.”¶ There are numerous organizations and individuals dedicated to rebuilding native plant communities one sterile lawn and farm field at a time. Dr. Tallamy, a longtime evangelizer for native plants, and the author of one of the movement’s manuals, “Bringing Nature Home,” says it’s a cause everyone with a garden or yard can serve. And he says support for it needs to develop quickly to slow down the worsening crisis in biodiversity. When the Florida Department of Transportation last year mowed down roadside wildflowers where monarch butterflies fed on their epic migratory journey, “there was a huge outcry,” said Eleanor Dietrich, a wildflower activist in Florida. So much so, transportation officials created a new policy that left critical insect habitat unmowed. Here are three great videos that demonstrate the importance of bees in our ecosystem. As Silvia has always been a beekeeper at FAF, we believe that the bees along with birds are great flagships for measuring Sustainability. We are encouraging our Bobolink farmers to begin cultivating bee hives in their properties. The bees will help on the pollination of the coffees and the honey will bring an extra income to the families.The number of bees in each farm will become a great measurement of the farming practices. Please enjoy these interesting videos.